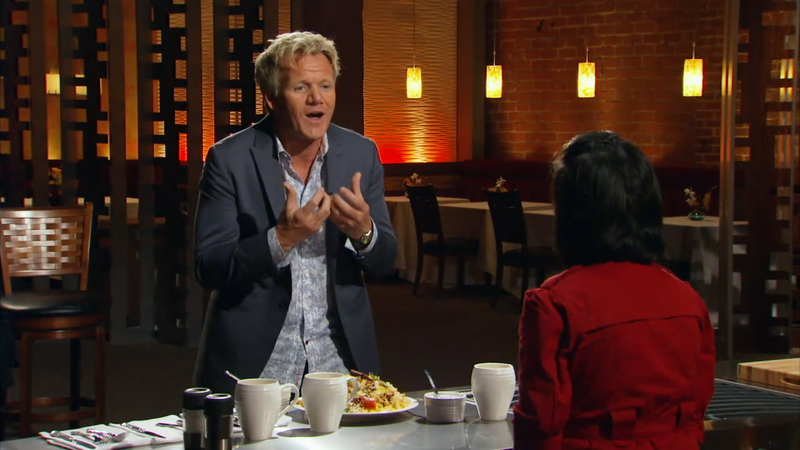 Previously, in the MasterChef saga: Yup, I'm Going to be on Gordon Ramsay's MasterChef! Spoiler alert! 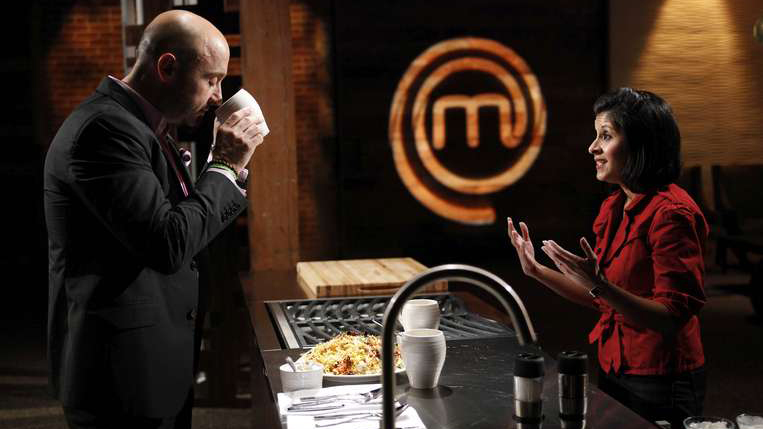 If you haven't watched the second MasterChef episode yet, you can watch it here in the US and here in Canada. 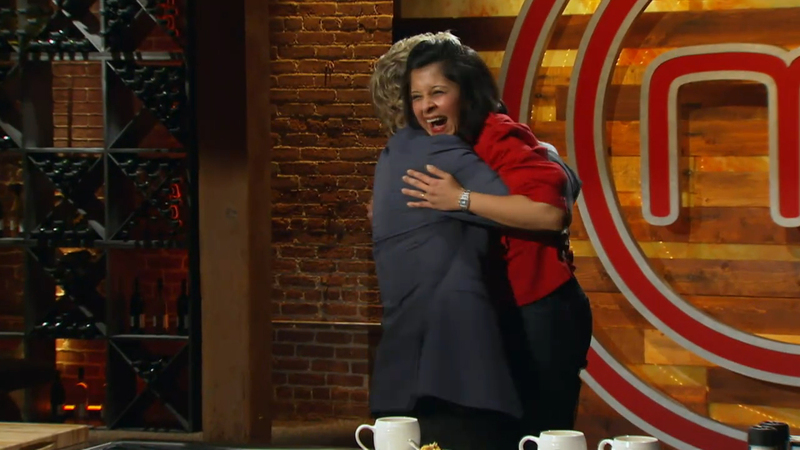 In March, 2010, Chef Gordon Ramsay hugged me. He not only hugged me but actually picked me up and said he'd been waiting for my dish all his life. Wait, I'm getting ahead of myself. But man, I really needed to see that first line in print. 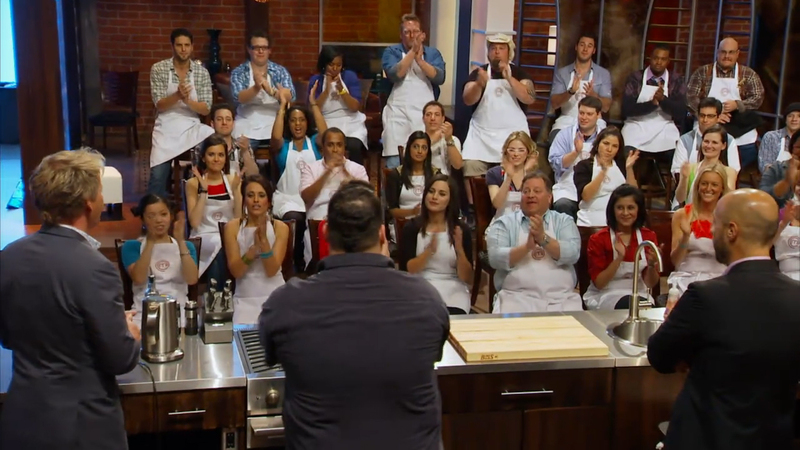 After months of auditions across the country, the MasterChef folks flew fifty contestants to Los Angeles for the show. Fifty. Out of thousands. I'm not familiar with the intricacies of the casting process but the contestants were fifty of the most well-spoken and diverse people I have ever met in my life. It was both exciting and totally daunting. They put us up in a snazzy hotel and sequestered us until the actual filming. Do you know how hard it is for fifty people who love to talk, cook, and eat to be locked in a hotel room? In an effort to remain sane, people resorted to all sorts of MacGyver tactics like talking to their neighbors through the walls and making grilled cheese with an iron. And then, one day, they brought all fifty of us to the studio for the first challenge: cook your signature dish for three of the top figures in the culinary world. Chef Gordon Ramsay, of Hell's Kitchen, Kitchen Nightmares, buff arms, and profanity fame, Graham Elliot, the youngest four star chef in America, and Joe Bastianich, restaurateur and winemaker extraordinaire. Oh, and Mario Batali's business partner. No pressure, right? Up for grabs? The coveted MasterChef apron. I opted to make a chicken biryani, the quintessential Pakistani chicken n' rice dish. I'd grown up eating it and had made a million times. Plus, it had my mom's seal of approval and her dead stare could give Joe Bastianich's a run for his money. Oh, and I'd never cooked a whole lobster or made my own pasta and I was at least smart enough to realize that my first time attempting those things should NOT be on camera. Heck, with my luck, the darn lobster would escape and I'd have to go chasing it around the set. Come to think of it, that would've made for some great teevee. The set had three cooking stations, all in a row, each equipped with their own stoves and sinks. There was also a giant, drool-worthy supply room stocked with the newest technology in pans (non-stick pans with the power to sear food), all manner of dishes, a whole mess of tagines (and we all know I love me a good tagine), and a sous vide machine. Heck, before this experience, I didn't know what sous vide was. I'd certainly never been in the presence of a sous vide machine. So, I used the newest, coolest equipment ever to make an old, comforting dish. Then I walked down the longest hallway of my life, pushing my cart with my super clammy hands, and wondering why I didn't stuff kleenex under my clothes to mop up the dripping sweat. TMI? Maybe, but this a behind-the-scenes-look and let's be real, it was sweaty times behind the scenes. I put my dish on the table and suddenly, there were a million flashes from the cameras and a barrage of questions. As an aside, if you find yourself in such a situation, concentrate on the judges. Don't stare at the camera guy with the mohawk. Do not stare at your sweaty palms. Look at the judges. Because really, it's an awesome experience. When else will you have the opportunity to discuss your cookbook collection with men who have written cookbooks? When will you get to talk about your favorite restaurant with men who own restaurants? Only once my friends, only once. And the first words Chef Ramsay utters? "Has anyone ever told you that you sound like Minnie Mouse?" No Chef, I wasn't aware of that I sound like a cartoon mouse. I think it's actually closer to a cartoon chipmunk. Graham and Joe tasted the biryani. Graham had two bites which I took to be a good sign. Either he liked it or he was hungry, and I figured both of those things would work in my favor. And yet, I knew I wasn't in clear. I stood back as Chef Ramsay approached. The man was tall. But then again, when you're 5'2, everyone's tall. And he said, "The last time I made biryani, it was for an Indian prince's wedding. 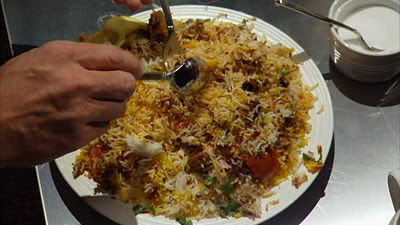 I made it with the best biryani chef in London and it took three days. So, I know biryani. And this had better be good biryani." Gulp. At that moment, I seriously wished I'd gone with the lobster. I would've chased the darn crustacean around the set if I had to. He took a bite. Contemplated. Then, he came around the table and hugged me and said, "I have been waiting for this my entire life." I assume he meant waiting for this dish and not waiting for a little, brown girl. I mean, let's be real. World class chefs aren't waiting for little, brown girls to roll on by. So, I did what any little, brown girl would do in such a situation. I squealed like a little, brown girl. Then, he picked me up in a ginormous bear hug. 3 judges, 3 yes'es. And that, ladies and gents, was the best (and sweatiest) day of my life. PS: My giveaway is still going on! You could be $40 richer. What are you waiting for? Go enter! ok, I watched the second episode on Tuesday and I've been meaning to send you a message... I saw the hug/pick up but they didn't show you cooking!! I was so bummed; my husband had to listen to me complain about this all night :) I'm so excited for you! Can't wait for more... seriously, can't wait!!! omg omg thats g hugging u..tht is incredibly..damn i wish i was somewhere in the US or canada so i could frikking watch this..
Oh woowowowo !!! So excited for you, still can't view the videos but so happy to hear that things went well. CONGRATSSSS! I missed it, but I am going to watch it online! Us Pakistanis know how to do biryani right ;) ! I watched it and didn't even know you were in it...I'll be rooting for you now, congrats! 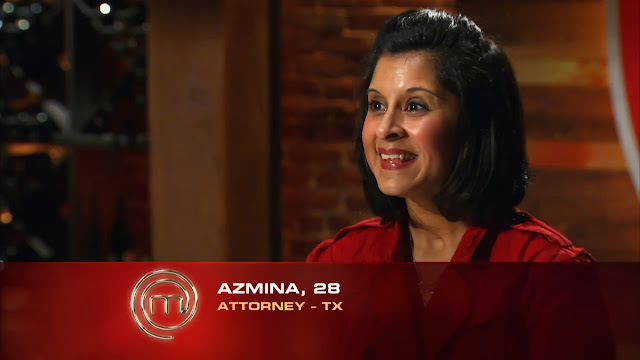 Azmina- I would blame my emotions watching masterChef on hormones but I think it's the show! It's a total tear jerker! The stories are beautiful, passions are high, and Joe Bastianich is...well, Joe Bastianich. I so happy for you!!! It's fun watching and rooting for someone you like so much- I mean, between being 5'2, a lawyer, and loving T. Keller, I feel like I'm living my MasterChef dream through you. WHAAT?? You're Pakistani?? :-P Just kidding. Azmina you are awesome and an inspiration. Don't forget that. You are amazing and beautiful and it has been so fun to watch you. I'm so excited for you too! Warmest congratulations! I'll be over soon for some biryani! OH my how wonderful! I'm so proud of you. I bet you felt like a million bucks. Congrats again! I watched, thanks for more of the details, I bet that was awesome and wow, such a huge accomplishment, congratulations! You looked great and so did your biryani. That's so awesome! I'm so excited for you! What a great opportunity for you to have. I'm beaming. What an incredible experience for you. Of course he loved it. You cooked a passionate, meaningful dish for him. Seems to me they didn't show you because it was such an open and shut case...you were a lock from the first bite. No excitement for the general audience in that; just huge excitement from your blogosphere family. We're all cheering you on HUGELY. You are hilarious girl! The only reason I'm watching MasterChef is cause of you. I never watched it before but when I found out you were on I set it on my pvr. I'mma cheering you on till the end Azmina! You're 5'2 and Ramsay already looks so tall. I would look tiny standing next to him cause I'm only 5 feet. Anyhow, huge congrats on making it through to the next round! Can't wait to watch more of your adorableness! Rock their aprons off Azmina!!!!!! WOOHOO!!!!!!!!!!!!!!!!!!!!!!!!!!!!!!!! You are AWESOME on camera!! I only wish...I could get a bite of that biryani! That is so fantastic! Congrats and best of luck to you! Keep us all posted, I mean those of us that can't watch you on the show. Yay! Maybe he's been waiting for a biryani that doesn't take THREE DAYS to make and is just as delicious? Either way insanely awesome. I'm so glad you posted this---I was sooo currious! Azmina, I've said it before and I'll say it again. You are awesome! What a thrill for your dish to receive such resounding yeses. Congrats! This is amazing!!! I'm so excited for you!! Getting a hug from Gordon really means something. Biryani simply rocks! So proud of you! This is so ridiculously exciting to me. Congrats!! And thanks for all the behind the scenes info :) I bet you've been bursting to post this since March! 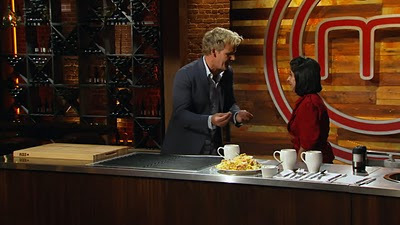 First of all...I rarely watch TV...but I am riveted to Masterchef because of YOU! I am so excited for you...your post brought tears to my eyes...GO AZMINA!!! I am so incredibly excited for you! You have no idea! So proud! Azmina, from Gordon's point of view, hugging you was the least he could do considering he'd been waiting all his life to taste a dish like yours! Congratulations, you're amazing! It is so fun that we are going to be able to say "we read her blog Before she was famous." Thank you for the fun behind the scenes look. Azmina,so happy for you! I can't wait to read more! Yayyyyy!!!!!!!!! Fantastic, wonderful, amazing news -- good for you!!!! CONGRATULATIONS!!!!!!! On top of the congratulations, you are brimming with clarity in you're writing. No matter what happens, hold on to that. Have fun. Soak up every second. Then enjoy the reflection. Thanks for writing something I liked to read. Go get'm girl. Wow, what an incredible experience! Great photos. Congrats on making a kick a** biryani! I envy you. What an amazing moment! Incidentally, I'd been waiting to meet my twin my whole life... for whatever it's worth, you made my day that day, too. Just watching the show intimidates me - lol... I began to question my culinary skills during the first episode! As I've said before - you go girl! Congratulations! What an amazing experience! Congratulations!!!! I'm rooting for you! That whole biryani comment of his would have totally freaked me out. I'm watching you right now!!!! Glad to see you made it. I look forward to watching your journey. I've been MIA from the blogging world because of my move, and I've been wondering what has been going on with you! Oh Azmina... I was so sad to see you go! I was rooting for you... and my kids were cheering you on! Every time I saw your smiling face I said out lout, "there's Azmina, my food blog friend". OMGOSH!!! YAY!!! I can't wait for Master Chef USA to come on in NZ orrr I guess Korea since I'll be living here for awhile lol. Yay for you Azmina! That's amazing, I can't believe you got a hug from Gordon Ramsay! Actually I can believe it, coz I know how much of an awesome cook you are! Keep me posted with updates!!! 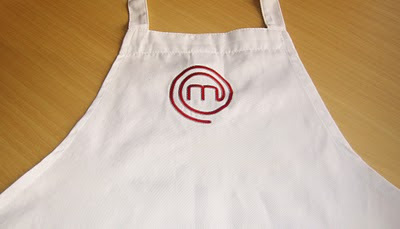 Damn, I turned on MasterChef last evening - it was the first chance I had - in the hope that I would see you. Sadly not.